Over 100 professionals from the government, the business community, science institutions, non-governmental organizations and international organizations gathered in Beijing on November 26th for the "Food Waste Forum: Multi-stakeholder Platform on Sustainable Food Supply and Consumption for Food Waste Reduction", to promote the knowledge-sharing initiative for the global measurement and reduction of food loss and waste. A report published by the Food and Agriculture Organization of the United Nations (FAO) in 2013 showed that 1.3 billion tons of food is lost or wasted every year – in fields, during transport, in storage, at restaurants, and in markets. 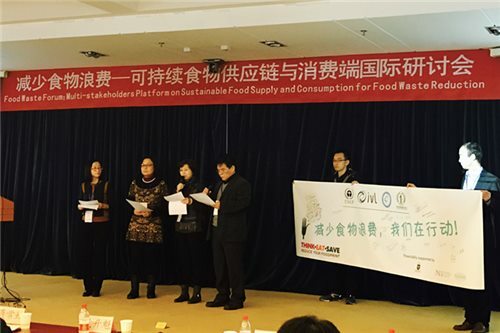 Xie Yuhong, Deputy Secretary General of the All-China Environment Federation (ACEF), delivered an opening remark at the event in which she stated: "It is no secret that food loss and waste is a big problem." Economically, food loss and waste constitutes a wasted investment lowering the income of farmers and multiplying the expenses of consumers. Environmentally, it inflicts a host of damage, such as the inefficient use of water and land, which in turn worsens the condition of natural ecosystems and impedes the services they provide. "Take food decomposition for example: a large amount of methane, a greenhouse gas that is 27 times more potent than carbon dioxide, is released into the atmosphere as a result of food decomposing in landfills." She added that China is already on its way to reduce per capita food waste during processing and consumption, aiming to achieve its goals through policy guidance, technological innovation, and the transformation of consumption models. Dr. Jiang Nanqing, the Programme Management Officer of United Nations Environment Programme (UNEP) China, said that UNEP aims to strengthen cooperation with all countries in order to ensure the implementation of target 12.3 of the UN Sustainable Development Goal, which calls for the global halving of household and retail food waste by 2030, and the reduction of food losses across the supply chain. "In 2013, we launched a campaign called 'Think.Eat.Save. Reduce Your Foodprint', which aims to accelerate action and provide a global vision for the many and diverse initiatives currently underway around the world. In recent years, China, along with UNEP, has taken actions on food loss and waste, such as the 2016 Sustainable Consumption Week on Green Life," she said. Over 100 professionals from the government, the business community, science institutions, non-governmental organizations and international organizations gathered in Beijing on November 26th for the "Food Waste Forum: Multi-stakeholders Platform on Sustainable Food Supply and Consumption for Food Waste Reduction", to promote the knowledge-sharing initiative for the global measurement and reduction of food loss and waste.